Maverick Transportation and Schneider have been testing the MirrorEye camera-based system from Stoneridge Inc. Thus far, fleets testing the aftermarket MirrorEye system have kept traditional mirrors in place on those trucks to comply with regulations, but that will no longer be a requirement in the years ahead. On Dec. 26, the Federal Motor Carrier Safety Administration an­nounced it issued a five-year exemption allowing truck and bus operators to use Stoneridge’s mirrorless camera system in lieu of conventional mirrors. Newell said Maverick’s drivers like the improved visibility from the camera system in inclement weather and at night. “When it rains, they don’t have any of the problems that come with water on the mirrors,” Newell said. Heaters in the cameras keep them free of frost and ice. Schneider has about 300,000 miles of experience with test trucks equipped with the MirrorEye system. Fleets in North America have been testing MirrorEye prototypes, but Stone­ridge has said production of commercial units will begin this year. Based on accident-cost data, Stone­ridge believes the payback period for its camera monitor product will be less than a year, Stephen Fox, the company’s vice president of business development, told Equipment & Maintenance Update in early December. Thomas DiSalvi, vice president of safety and loss prevention at Schneider, said the camera system appears to provide a safety benefit, but it’s not easy to quantify given the smaller scale of the pilot program. However, the drivers testing the technology “gave nearly-immediate feedback on how much better they could see in wet weather and in low-light conditions,” DiSalvi said. Green Bay, Wis.-based Schneider ranks No. 7 on the Transport Topics Top 100 list of for-hire carriers in North America. Another feature is the camera’s ability to change the field of view. Newell added that the camera monitor system will improve lane changes because there are no blind spots down either side of the truck. Removing the mirrors could help fleets save money. The camera arms on each side of the truck are more aerodynamic than the larger conventional mirrors, and the reduced drag could improve fuel efficiency. Schneider plans to conduct fuel-­consumption testing. “The safety improvement, along with fuel savings, may strengthen the [return on investment],” DiSalvi said. In some cases, the driving force for adoption of this technology will be more about safety than ROI. “In terms of evaluating the benefits of this technology, the first thing we think about is the accidents and injuries that it could prevent,” Newell said. Cargo Transporters, another fleet that is expecting to test the MirrorEye system, also sees safety as the key reason to consider the technology. “We ask the basic question — would a technology have a significant impact on safety? If we think it will, unless the cost is entirely prohibitive, we’ll do it,”Cargo Transporters Chairman John Pope said. Two other technology providers with camera monitor products are Bosch and Continental Automotive. The digital side-view mirrors from Bosch will go into production in 2019, said Tim Wieland, manager of public relations for Bosch in North America. “The system is available directly to OEMs and is not available in the ­aftermarket at this time,” he said. Digital technology makes it possible to have a situation-specific display, according to Wieland. “When the truck is driving on the highway, the driver can see further behind the vehicle, while in cities the angle of view is made as large as possible to provide greater safety,” he said. The system uses sensor data to adjust the field of view as needed. Continental Automotive, a division of Continental AG of Germany, offers the ProViu Mirror camera monitoring system. Christopher Schrecke, head of media relations for commercial vehicles and after­market communications at Continental, said that the prototype tests ­yielded “excellent results” and that the tech­nology is ready for OEM development. The ProViu Mirror system is a replacement of the conventional mirrors, but product enhancements in the future may bring additional features, Schrecke said. For example, merging the mirror system with other systems, such as radar, would make it possible to use object-detection algorithms, which could alert the driver to potentially dangerous situations. Meanwhile, when Pope, of Cargo Transporters, sat in a demo truck at American Trucking Associations’ 2018 Management Conference & Exhibition in Austin, Texas, he was struck by the view provided by a “look-down” camera on the passenger side of the cab. According to Stoneridge’s Fox, this camera shows the driver the area on the passenger side of the cab between the front corner and the cab’s rear wheels. DiSalvi said Schneider’s test drivers particularly liked having this blind spot eliminated. The display for the look-down camera is typically mounted between the sun visors. However, one of the concerns that comes with any new technology is reliability. James Burg, president of James Burg Trucking Co., raised the question of how repairs to a damaged system would be handled. “If the camera monitoring system goes down, how do you respond?” Burg asked. When a mirror is damaged, sending a repair technician out to a truck to handle it is clearly an option. Fox, however, said that redundancy is built into the system. There are two cameras in each of the side-view camera arms, which means that if one camera fails, the other will provide a view of that side of the truck. “In our 2 million miles of tests, we’ve found that it’s highly unlikely that the system will fail,” Fox said. There is always the possibility of physical damage to the camera. However, damage to the camera arm is less likely than damage to a cab’s side-view mirror, Fox said, because the camera arm is placed higher on the cab. Also, the camera arm has a built-in breakaway feature and will fold in if it is struck by something as the truck moves forward. 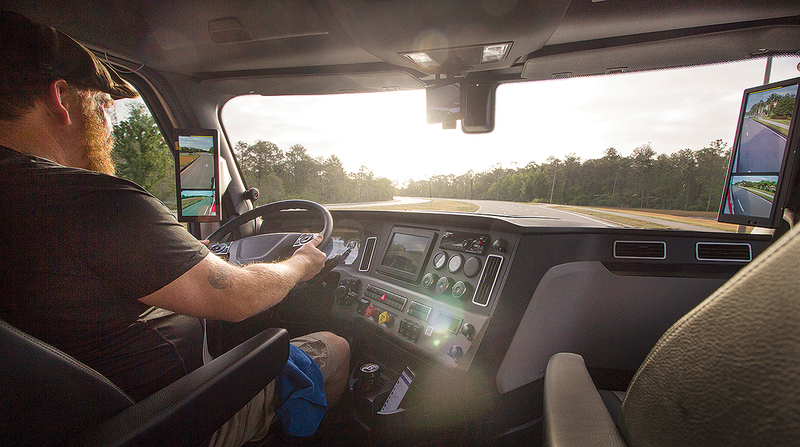 Another possible development is connecting camera monitoring systems with in-cab video systems from companies such as SmartDrive.